If cleanliness is next to Godliness, then I'm the freaking Ayatollah of the temple that is my shower, preaching into the hose to my loyal audience of shampoo bottles all dutifully lined up as if rapt with attention. All hail the High Priestess of The Clean. 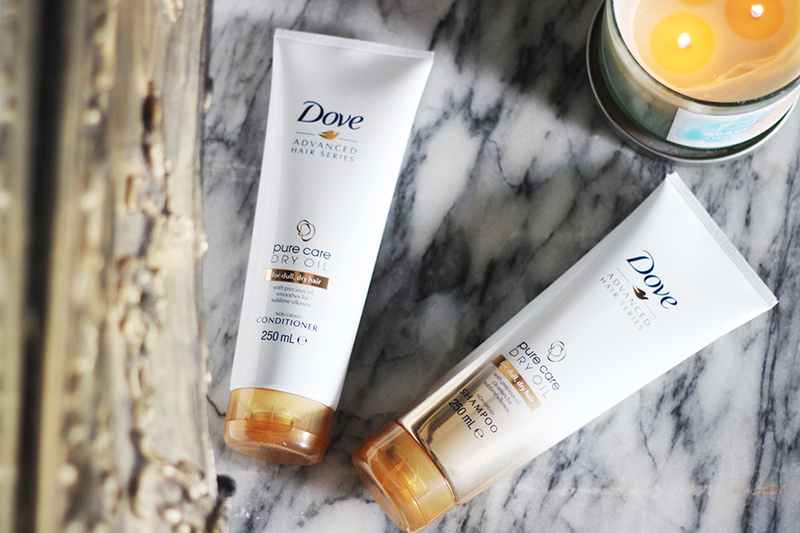 Hair: Dove 'Pure Care Dry Oil' shampoo and conditioner. 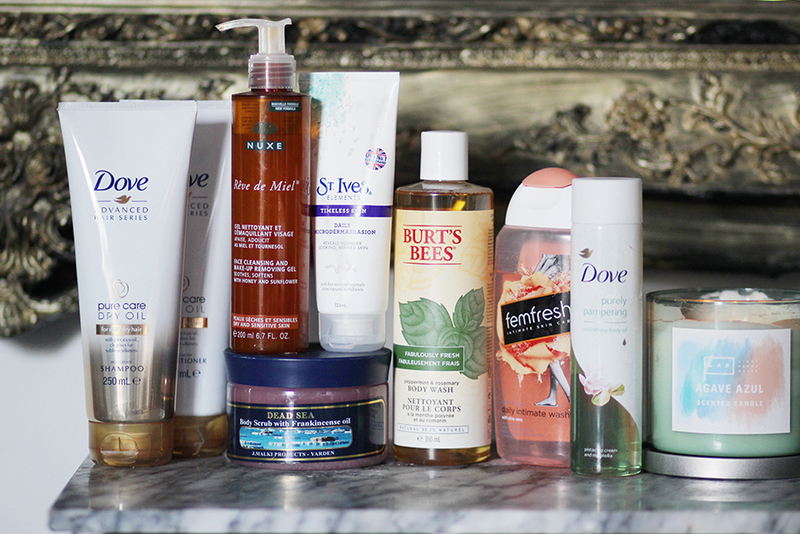 I love my drugstore haircare, I do. My healthy, waist-length tresses are proof that you don't have to spend a fortune to be Hair Apparent. I once spent £20 on a minuscule bottle of salon shampoo and all it did was give me a bird's nest. I'll stick to the 3 for 2 aisle at Boots, ta. I've just dyed my hair back to natural black after summer bleached it an unappealing brown, and am using Dove's dry oil-infused shampoo and conditioner from their Advanced Hair series to offset the damage from colouring. 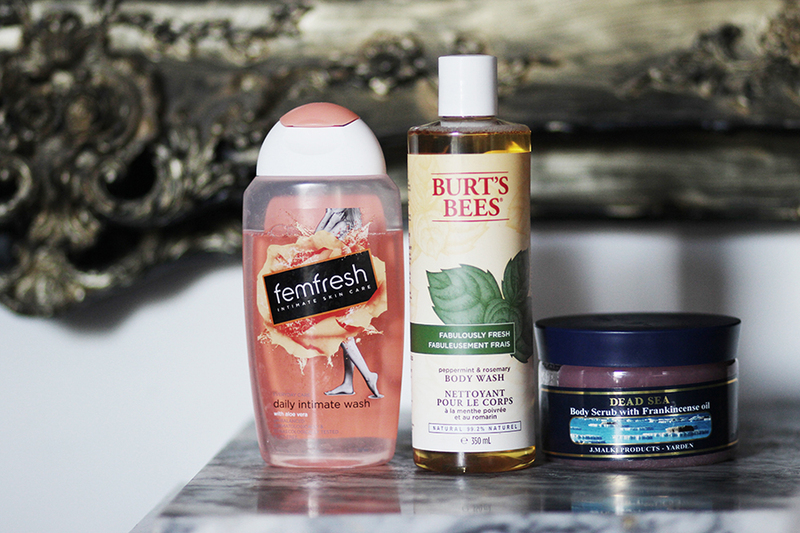 Body: femfresh daily intimate wash, Burt's Bees rosemary and peppermint wash, Dead Sea body scrub. Of all the exfoliants I've tried, none is as effective as this unpretentious, chemical-free body scrub fused with nutrient-rich salts with Frankincense aromatherapy oil. My Malaysian nationality makes it a nightmare to travel to Israel, so this little jar is my passport to the miraculous minerals of the Dead Sea. After I rid myself of the grumps with soothing frankincense, I perk myself up with fabulously fresh peppermint and rosemary wash from Burt's Bees. The minty-fresh goodness goes a long way toward to adding some zest into my morning routine! Of course, one can't achieve 'inner beauty' without, um, literally starting from the inside. No arsenal of feminine secrets is complete without the low pH balance of the femfresh range. Here's another shower secret - the femfresh daily intimate wash is so sensitive and delicate that I sometimes use it as face wash.
Good old St. Ives. Who hasn't tried, tested, and loved their famous apricot scrub? 'Timeless skin' is right - although I've long since graduated from the peachy-scented classic of my teenage days, their 'grown-up' daily microdermabrasion face scrub makes every day a Throwback Thursday. 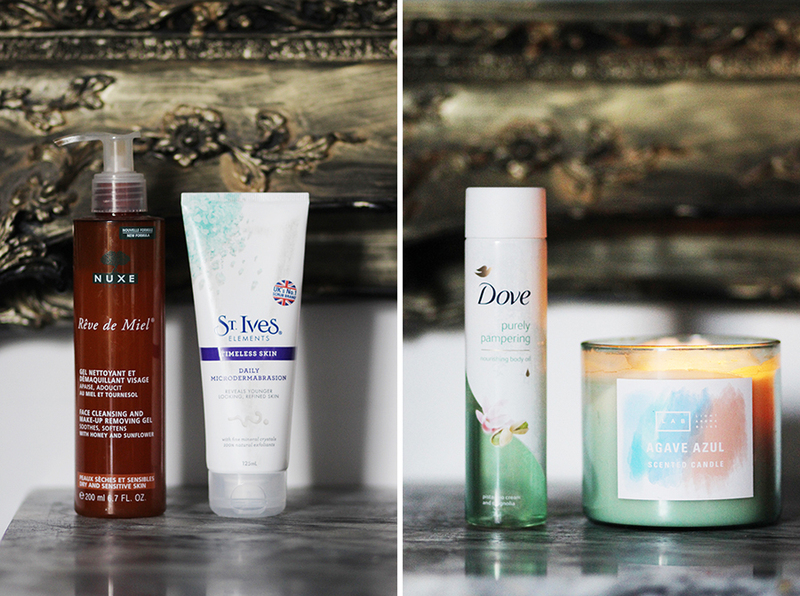 While my haircare is decidedly budget, I do sometimes allow myself a little luxury with my face wash. Nuxe may be a French pharmacy staple, and maybe I'm guilty of glamourising foreign brands in languages I can't read, but their Rive de Miel face cleansing gel is my little splurge to myself. You're welcome, face. Seriously, though, this stuff is as gold as it looks - a dab of the gel on a cotton pad, a gentle swipe, and an entire face of makeup glides off as effortlessly as the Parisians are chic. I like my twice-daily ablutions to be accompanied by the fragrance of a scented candle, and lately I've been walking on cloud nine thanks to the Light Aroma Bliss (LAB for short) - one of at least four obscure candle brands I found in TK Maxx. I bought about six different LAB scents, and Agave Azul is my shower time favourite du jour! It just goes so well with the dizzyingly moreish sweetness of my current body oil - the pistachio and magnolia body oil from Dove. Not at all greasy, but velvety smooth (and smells so damn delicious) - it's the perfect topper to my skin and an indulgent end to my shower ritual.